Banner - about five feet wide (pennants are 8" high). 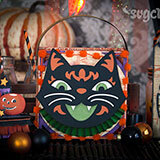 Black Cat Gift Bag - 7 x 9 x 2.5". 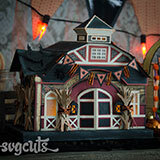 Haunted Barn - 12" wide, 11" high and 7.5" deep. 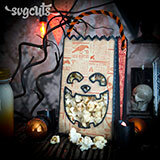 Jack O' Lantern Popcorn Bag - 4.5 x 7.5 x2". 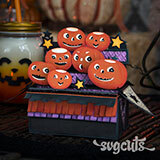 Pumpkin Party Box Card - 7.5 x 5.5 x 4" deep when standing. When folded flat, it measures 7.3 x 5.5". Updated July 19, 2017 to fix issues with black_base3.svg and black_base4.svg for Cricut Design Space users. To receive an updated copy, please contact us. 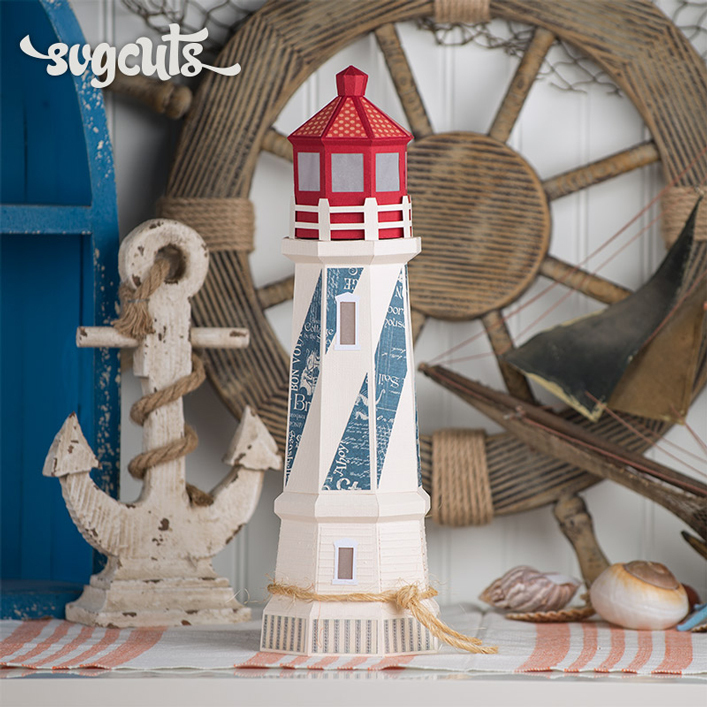 Sure Cuts a Lot, ECAL, MTC, Silhouette Studio Designer Edition, Cricut Design Space or any other software that allows importing of SVG files. 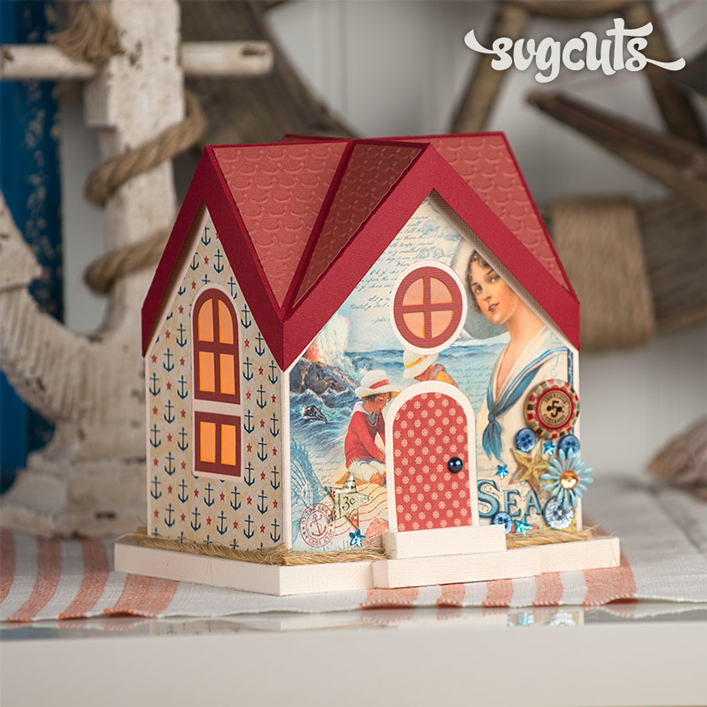 This Kit contains pieces that are too large for 12x6 and 8.5 x 11 mats. 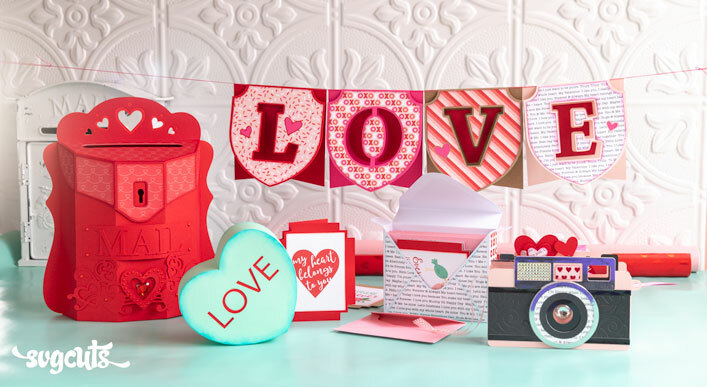 Patterned paper shown is from the Rare Oddities Collection by Graphic 45. 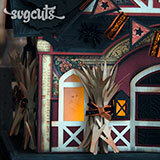 Haunted Barn: Recollections spider embellishments, Halloween Trimmings ribbons by Tim Holtz, one letter-sized piece of white vellum for the windows. 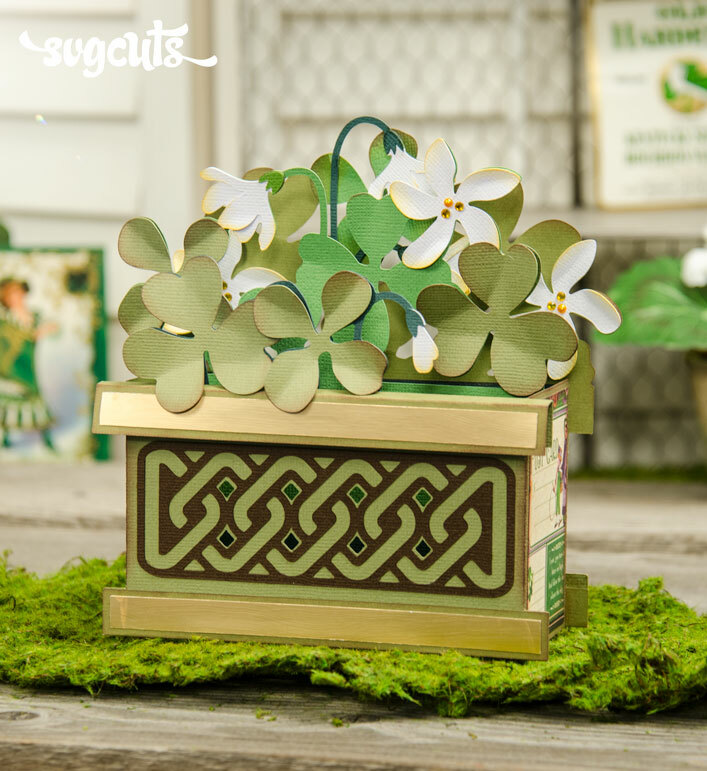 Embossing folders: A2 Spider Web by Paper Studio and Moguls by Sizzix. 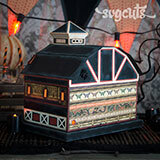 The barn can be illuminated by several battery-powered or plug-into-the-wall lights. 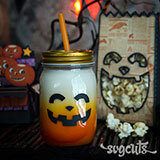 Jack O' Lantern Face Mason Jar: you can size your face to any size, depending on the project you have in mind. I put mine (vinyl) on a 5.5" orange ombre mason jar from Michaels. 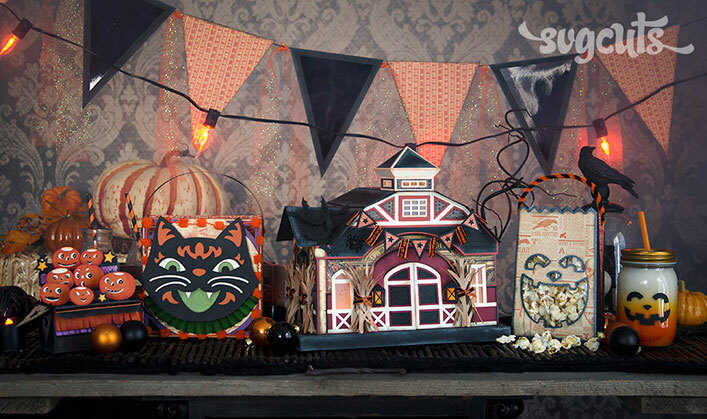 Jack O' Lantern Popcorn Bag: holds one standard-sized sandwich baggie full of popcorn inside. Black pre-embossed shimmer paper from Michaels (sold in packs of five). Two chenille stems (pipe cleaners) twisted together for the handle. Pumpkin Party Box Card: Halloween Trimmings ribbon by Tim Holtz. Tiny pearl embellishments by Recollections (pumpkins' eyes). 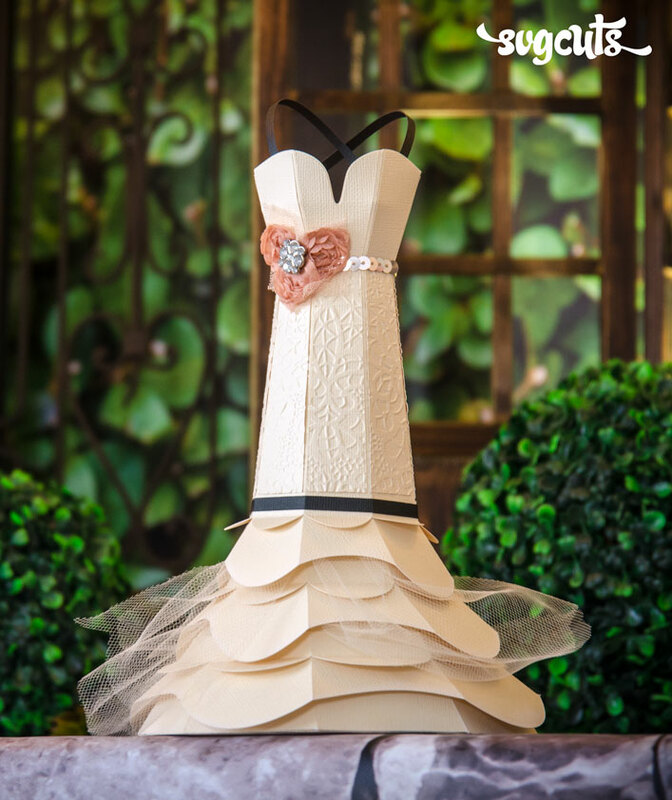 Embossing folder: Diamonds by Sizzix.